Welcome to Regal Heights Healthcare & Rehabilitation Center, a 172-bed, subacute care and skilled nursing facility nestled in picturesque Hockessin, Delaware. We are proud to provide New Castle County, and the surrounding counties of Kent, Sussex, Delaware and Chester, with an expansive, continuum of post-acute services and long-term care in a warm and welcoming environment. 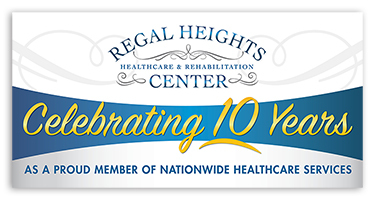 As a proud member of Nationwide Healthcare Services, Regal Heights is a nursing home committed to delivering the highest standards of excellence to expedite your recovery. Our specialized post-hospital recovery care includes intensive orthopedic rehab, complex wound care, short-term respite and memory care.